These are perfect for making candle favors for beach weddings! I love them! Adorable! So cute for my Cape Cod themed wedding! Bought these for my small Cape Cod wedding at a B&B. Perfect to hold shell shaped chocolates and blue tissue! I used these buckets as little table centerpieces for my daughter's first birthday party. I filled each bucket with different kinds of candy (Mike and Ikes, jelly beans, dinner mints, etc.) and while I planned to tie a couple balloons to each handle, they were too small and I was afraid they would blow away as it was a windy day. They served their purpose and looked very cute on the tables! "They are smaller than they appear". These bucket were smaller then they appeared, but I made them work anyway. We are using them filled with Salt Water Taffy as a Wedding Favor. Since, it is a Beach Theme wedding, I hot glued a simple ribbon and one mini star fish around each of the buckets. And then I attached a Thank You tag from the Bride & Groom to the handle. Since they were smaller, we are able to place one at each place setting for each guest. I made wedding favors for my son's beach side wedding. They are perfect for holding Jordan Almonds, candy, or small silk flower arrangements. These are absolutely adorable and by adding a place card will be part of our Easter table setting. Jordan almonds fit great - - as long as you don't want too many in there. Decided to fill these with chocolate shells for a beach-side wedding. I bought these recently to use for my wedding favors - I am having a rustic/vintage style wedding at a country club. They are just like they look in the picture... the quality is a little poor, but they were fairly cheap so I guess I was expecting that. By poor quality I just mean they are easily bent, so many of the handles had to be bent back into place. But once they are you can't tell! And once they are dressed up with a bit of ribbon I'm sure they'll look even better. Received my order today. The pails were a bit smaller then i expected, however, they look cute and very good quality. I ordered the sheer organza bags as well and the quality there was very good! I was very please with the products over all and impressed with the way they packaged the products! I would definately order here again! Super Cute for a Beach Theme Wedding! I am using the pails to hold my wedding favors in! I purchased the personalized sunscreen bottles and personalized lip balm from beau coup. Then placing them in a sand box for my guests. Im so happy I decided to do this idea. We used this product at a bridal shower! We had so many compliments. They were just adorable, and they looked so pretty on the tables! I would definitely recommend this! I am often hesitant to order online will the fear of receiving an incorrect order or damaged merchandise, but I would highly recommend this retailer to others and will plan on placing additional orders for product in future. The pails arrived as ordered. [...]The measurements listed in the product description were accurate. These mini pails make special gift certicate holders for anyone who does the "handy" work around the house. I'm planning on gluing on some beads along the bottom in the colors of my daughter's wedding and adding a matching unlit candle and personalized matches. They're great for holding small easy-to-get-lost items, rings, keys, etc. I think my grandson will enjoy "working" with these as well. They'll work for holding paint brushes, crayons, beads, and other small craft items. He'll probably want to haul rocks (pebbles) in it. I filled the pails with the Gourmet Chocolate Mints. I tied grosgrain ribbon on the handle and set them at each table setting. used for favors containers for a wedding, great handleing, mini size and cute on display !! Purchased for my wedding. Nice little bucket. Like the ability to choose painted or not. Unfortunately it's not food safe, so I had to package my treats in a sandwich bag to protect it. Holds a nice snack size amount of whatever you would like. Can be reused for various things, like paperclips, or regifted as a little extra to a main gift. You can make anything using this product, and it will make a perfect giveaway! The silver pails began to rust quickly. We are putting these on the tables at our outdoor wedding in just a few weeks...probably putting after dinner mints in them. They are very cute, though definitely on the small side. Just make sure you understand the size before you buy them. I knew what to expect, as I drew up a to-scale pic before buying. I am pleased with the product. used as a bridal shower party favor. i planted tiny flowers in each pail. I was happy to find these pails - I had seen them in other places online, but found Beaucoup's mini pails to be the best priced, and I have used Beaucoup for favors before and know that their products are high quality. I am planning to use the pails as mini "buckets" and fill them with nautical candies for my wedding. I was very happy with the product - each bucket was individually wrapped and well packaged, so there was no damage due to shipping. They are smaller than they appear in the photo, but will work great for my wedding favors. these pails are great. I will use them at our wedding for the almonds. They are a little bigger than I thought, but that doesn't matter at all. I would buy it again (and I probably will, because my mom fell in love with them and asked me, where I got them from). I didn't realize the measurements listed online were from the top of the handle to the bottom of the pail. I expected the pail itself to be the listed height with the handle reaching above that. Maybe I just didn't read it correctly. Cute-sy pails! Useful for favors for many different occasions! These turned out to be just what I was looking for. They were used to hold candy wrapped in tissue paper and tied w/ a ribbon. Perfect size. I had purchased similiar white favor pails at one of the(will remain unnamed)dollar store chains to use as favors for my wedding. I am filling the pails with a variety of chocolate kisses wrapped in white tulle & tied with white curling ribbon. 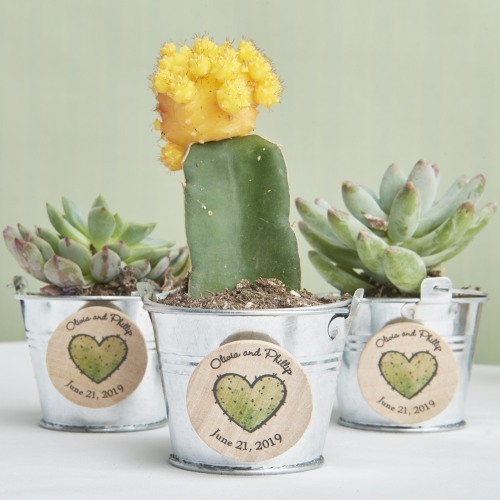 They were very inexpensive and I purchased what I thought would be enough for my wedding reception guests. The guest list increased & this particular dollar store didn't carry anymore favor pails. I searched online needing at least 30 more. I discovered this website & these particular pails that seemed very similiar to what I had already purchased. I ordered 30. They arrived within a week. I am so pleasantly surprised with the quality of this product. The pails are a bit larger than the dollar store ones. But, they are also better made, definitely a higher quality. They came packaged beautifully. Each individually wrapped and with such beautiful tissue paper around it and sealed with the companies logo. It was like I was receiving a gift! I am so very pleased with this company and their product and presentation! While they were definitely more expensive than the dollar store favor pails, I like these so much better. You definitely get what you pay for! I would definitely recommend purchasing from them! This is really cute but I would prefer it if it came packaged. This is great for guests to put candy in! Add the personalized stickers and some ribbon on the top and they are just perfect! They make a perfect touch! love these for filling with small treats - they add a chic industrial-farm element to my favor designs! Lend an air of authenticity to any garden or sea-themed event. Great for Hawaiian bridal shower! These were a hit at the bridal shower I hosted. Added some cute ribbon and some chocolate kisses and people had something small and tasty to take with them. So cute. Q:are they food safe? Or does the candy need to be wrapped? A:I would suggest wrapping it. Q:How many ounces does this hold? A:This item holds 3 ounces per pail. A:We are not able to paint the pails another color for you prior to shipping. Galvanized pails measure 1.75" at the base, 2.62" opening, and 2" in height (3.25" with handle). 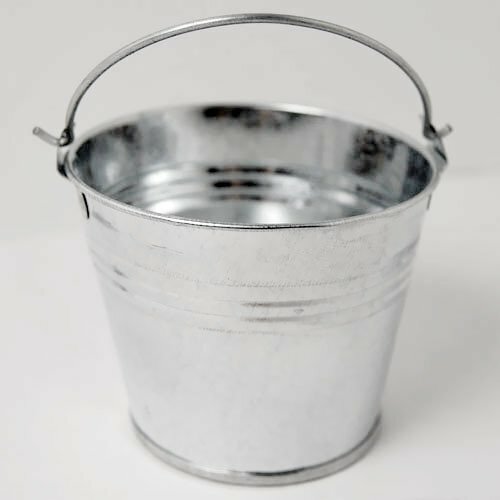 Pails come in silver and are coated for rust-resistance.